Mark from the UK continued his fishing holiday with a visit to Bungsamran Lake in Bangkok in search of monster carp and catfish. 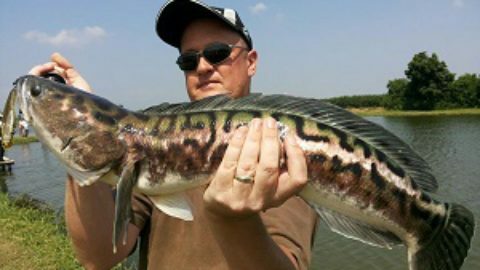 After acquainting himself for the first time with Striped Catfish at Now Nam Lake the previous day the angler arrived at Bungsamran Lake early in the morning ready for action. Fishing from the shed the angler chose to fish with sliding bungs in an attempt to catch a large Mekong Catfish. After mixing up the groundbait the angler soon had two floats fishing out in the centre of the lake. It was not long before one of the floats burst into life and was dragged beneath the surface of the lake. Winding down into the fish resulted in the rod being bent into full parabolic curve as a rapidly departing Mekong Catfish exited the swim. The extremely powerful Mekong Catfish embarked on an arm aching tour of the lake whilst Mark tried to regain control of the battle. After a fifteen minute battle the angler now started to get the upper hand and the Mekong Catfish was soon brought to the waiting net. 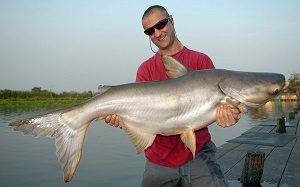 The Mekong Catfish was hauled onto the fishing platform and was estimated to weigh 20kg’s before a few trophy shots were clicked off. Whilst rebaiting the rod the other float being fished in the centre of the lake indicated a take as yet another Mekong Catfish moved away with the bait. Another ten minute battle ensued which once again saw the angler doing battle with an unseen Catfish which proceeded to charge off towards the other side of the lake. The Mekong was once again pumped back towards the fishing platform where it charged up and down the margins angrily. The Mekong Catfish was netted on the second attempt and was once again hoisted onto the unhooking mat. 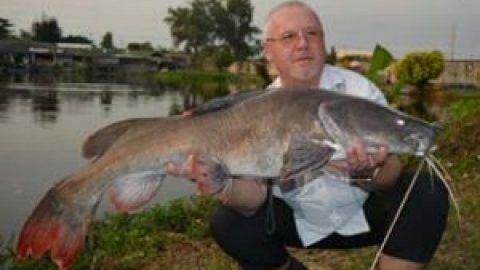 The good sized Mekong Catfish was estimated to weigh 25kg’s and was proudly displayed by the captor whilst trophy shots were taken. The rest of the day continued in the same manner with Mark landing a succession of Mekong Catfish to an estimated 22kg’s in addition to several Striped Catfish to an estimated 10kg’s. At the end of the days angling at Bungsamran Lake the angler had amassed a twenty fish catch with monster Mekong Catfish to over 25kg’s.